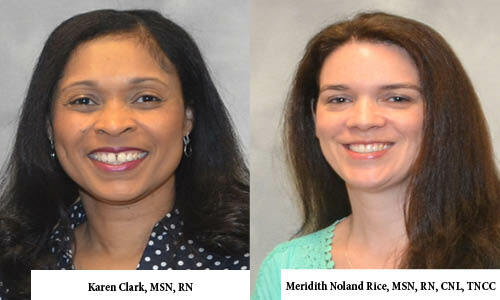 The MU Sinclair School of Nursing is pleased to announce Karen Cochran Clark, MSN, RN, of Baton Rouge, LA, and Meridith Noland Rice, MSN, RN, CNL, TNCC, of Tuscaloosa, AL, have been selected as Robert Wood Johnson Foundation Future of Nursing Scholars recipients for the 2016-2019 cohort (Cohort 3). As a PhD student, Ms. Clark is studying caregiver stress of grandparents raising their grandchildren. Karen is co-mentored by Lorraine Phillips, PhD, RN, FAAN, Associate Professor of Nursing, and Urmeka Jefferson, PhD, RN, Assistant Professor of Nursing. As a PhD student, Ms. Rice is studying ways to address hypertension and other risk factors for hemorrhagic stroke among racial and ethnic minorities in rural community. Meridith is mentored by Todd Ruppar, PhD, APRN, GCNS-BC, Associate Professor of Nursing. MU Sinclair School of Nursing is one of only 32 schools of nursing nationwide to receive a grant to increase the number of nurses holding PhDs. The Robert Wood Johnson Foundation’s Future of Nursing Scholars program will provide financial support, mentoring and leadership development to nurses who commit to earn their PhDs in three years. In its landmark nursing report, the Institute of Medicine recommended the country double the number of nurses with doctorates; doing so will prepare and enable nurses to lead change to advance health, promote nurse-led science and discovery and put more educators in place to prepare the next generation of nurses. The Future of Nursing Scholars program is intended to help address that recommendation. The number of nurses enrolled in PhD programs is not the only issue addressed by this program. The average age at which nurses get their PhDs in the United States is 46 — 13 years older than PhD earners in other fields. This program will proved an incentive for nurses to start PhD programs earlier, so that they can have long leadership careers after earning their PhDs.